Poised for the future of architecture, Lampert Architects is embracing sustainable design. Whether designing an urban master plan surrounding a light rail transit station, incorporating LEED credits into an automotive dealership, or specifying "green" interior finishes for a health spa, we are committed to designing for the future. 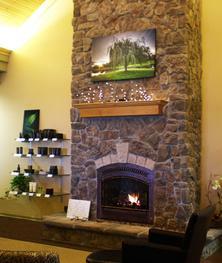 Using our green checklist, we tailor your project to your "green" goals. 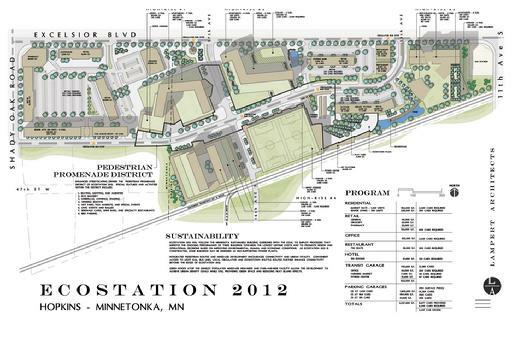 EcoStation 2012 will follow the Minnesota sustainable building guidelines. EcoStation 2012 buildings will be designed with the goal to employ processes that improve ongoing building performance towards the lowest lifetime costs and to promote design and operational decisions based on improving environmental, human, and economic conditions. As EcoStation 2012 is constructed, some buildings may be designed as self-supporting power plants. Integrated pedestrian routes and mixed-use development encourages connectivity and urban vitality. Convenient access to light rail, bus lines, local circulator and downtown shuttle routes further enhance connectivity beyond the edges of EcoStation 2012. Green roofs atop the densely populated mixed-use high-rises and park-and-ride facility allow the development to achieve urban density goals while still providing green space and reducing heat island effects.